Complex differences in organizations, when not addressed effectively, can lead to silos, lack of collaboration throughout the organization, damaged relationships and poor decisions. Our meeting design and facilitation ensures that all the best ideas are heard and appropriately considered, resulting in high quality solutions and a sense of ownership among all those involved. For more information, or to take advantage of a FREE consultation, contact us today. Is Anyone Interested In Rational Problem-Solving? Do we need to revive civility? 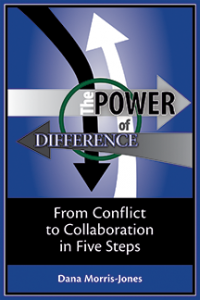 Dr. Dana Morris-Jones' book, The Power of Difference: From Conflict to Collaboration in Five Steps, has just been published. Learn more here. Your work with The Delphi Group, Inc. will have a direct impact on your bottom line, however you measure it!